So we chose option 3... HJ and I were on high alert the entire week but BJ didn't want to come out. So Dr. K said to go back to the hospital on March 9 for another induction. 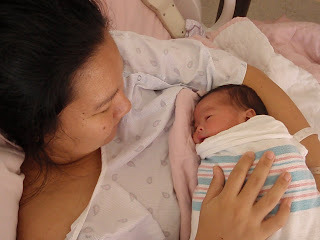 HJ and I nervously excitedly arrived at the hospital around 8am on March 9, but we weren't sure if the inducing was going to work, so we told our family members to be on standby. When we first got there, there weren't many patients; as the day went on, however, the hospital rooms were filled with women in labor. As soon as I heard that the rooms were full, I asked Nurse M to reserve a single room for me. It cost extra but was so worth it! Okay, so it's 8:30 am and they hook me up to the IV and start dripping in the pitocin. At first, it wasn't kicking in again. I was having contractions but they weren't strong and they weren't consistent. As mentioned earlier, there were many women in labor, so Nurse M and Dr. K came in every once in a while but not every hour like they were supposed to. (They were busy helping other moms give birth, which I don't blame them.) So anyway, they weren't coming in to check my dilation, which was fine because the pain wasn't that bad and when they did check, I was always stuck at 3 centimeters. However, at around maybe 3 o'clock, my contractions started getting worse, painful, and closer together... I kept telling HJ to tell the nurse to come and check, but whenever he would go outside to find Nurse M, she was in another room helping another patient. You often hear stories of women going crazy during labor and telling their partner all sorts of mean things... well, I admit I threatened my hubby. I was getting angry at him for not finding Nurse M, and I remember looking in his eyes and saying, "If I'm more than 7 centimeters, I'm going to kill you!" (Oops!) So at around 4:30pm, Nurse M finally came in to check me after helping Dr. K. with a c-section... she checks me, looks up in shock, and says, "You know... I think you're at 9 centimeters!" If looks could have killed... I think HJ would've been a gonner. At that time, I asked Nurse M if I could have the intrathecal (which is similar to an epidural) and she said she would have to ask Dr. K because I was so far along. THANK GOODNESS Dr. K said yes. I had to have two shots of the intrathecal in my spine because the first one didn't work so well, and after that, I couldn't feel much pain. The contractions kept coming and Nurse M asked me if I felt like pushing. My reply: "I think so?" haha, I wasn't sure.... but I pushed. Nurse M said I was a good pusher, and that she didn't think I would have to push for long... and I didn't! I think only pushed for 10 minutes before Dr. K came in and said he could see hair a full head of hair! I felt so overwhelmed... thoughts that were going through my head included: "What? Baby's coming now?" "His hair? Why? Is he right there??" So after a bit more pushing, Dr. K looked up and said, "Well, it must be a good sign! He's winking at me." HJ said his head was out. One more push and he was out at 6:02 p.m.
yup, it's good to document the birth itself so you don't forget! haha...people say you forget the pain, but i really don't think i'll ever forget the pain...i had an epidural after 5 hours of intense contractions...and the afterpains, with a 3rd degree tear after popping out an 8 lb 11 oz baby, were TERRIBLE. 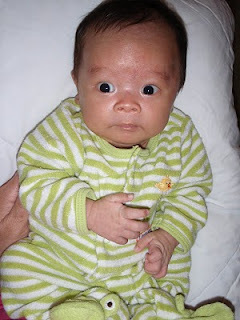 i totally know what you mean about the first poop!!! women have babies because men really wouldn't be able to handle the pain!!! good job, mommy!!! ASKC - WOH. An 8lb 11oz baby naturally? Wow, I'm lucky, BJ was only 6 lb 15oz.